Last updated 3:35 p.m. ET. Protesters across the world on Saturday called on Iran to end its clampdown on opposition activists, demanding the release of hundreds rounded up during demonstrations against the country's disputed election. Groups including Human Rights Watch and Amnesty International are backing a global day of action, with protests planned in more than a hundred cities. In a letter sent Saturday, opposition leader Mir Hossein Mousavi, former President Mohammad Khatami and 67 other prominent reformists urged Iran's top clerics to pressure the regime to release protesters and activists who they say have been tortured to extract confessions. Police said about 600 protesters joined a "noisy but peaceful" demonstration, outside the Iranian embassy in London, one of a series of events in cities across Europe. 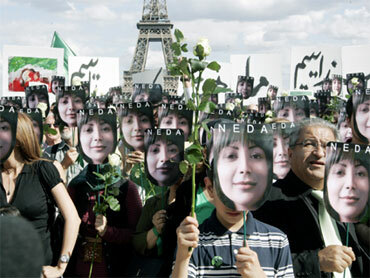 In Brussels, Belgium, protesters held placards carrying images of the detained or dead, including Neda Agha Soltan, the 27-year-old whose death - beamed around the world on the Internet - became a rallying cry for opponents of the regime. In Amsterdam, Iranian Nobel Peace prize laureate Shirin Ebadi urged the international community to reject the outcome of the Iranian election and called for a new vote monitored by the United Nations. Addressing several hundred people, she said Iran should not be allowed to become another Zimbabwe, apparently referring to the violence surrounding that African country's disputed presidential election. Hecklers in the crowd, some of them supporters of the monarchy ousted in 1979, shouted slogans of "Death to the Islamic regime." But the Iranian lawyer and human rights activist urged restraint, saying the protesters should be chanting for life and democracy rather than death to their opponents. In Tehran, Iranian police and pro-government militia attacked and scattered hundreds of protesters who had gathered in Iran's capital in response to the global demonstrations of solidarity, witnesses said. About 80 people wearing headbands, wristbands or bandanas in green - the color of Iran's protest movement - demonstrated in front of the U.N.'s European headquarters in Geneva. "The young people have had enough," said protester Jacky Carel, a member of a Swiss-Iranian cultural organization. "It cannot go on like this." Several hundred people staged a rally at Paris' Trocadero square overlooking the Eiffel Tower. Many brandished signs reading "Free Iran" and "Where is my vote?" while others stood behind a cloth banner meant to look like the bars on a prison cell. "We've had enough of religious regimes that don't have the Iranian people's best interest at heart," said protester Sakineh Davoodi, a 50-year-old cashier from Iran who has lived in France for 23 years. In the Pakistani capital, Islamabad, some 20 Iranians - among them refugees, students and others - gathered outside the local press club to protest the Iranian crackdown, yelling "Death to the dictator!" "Innocent Iranians are being killed," said Hessam Moghimi, 27, who has lived in Pakistan for about eight years. "We want justice for the blood that's been spilled." In Australia, there were small protests in Sydney, Melbourne, Brisbane, Adelaide and the capital, Canberra. About 50 people waved flags and banners reading "Stop torture" and "Iran election was a fraud" on the steps of the parliament of Victoria state in Melbourne. In Canberra, Ardeshir Gholipour, a 41-year-old refugee from Iran who arrived in Australia in 2000 after spending two years in an Iranian prison for political protests, said Western governments should take a tougher stand against the Ahmadinejad regime. "The Australian government should reject the Iranian ambassador - send a big signal," he said. About 80 people gathered in Tokyo, draping green scarves around their necks and lighting candles. The crowd watched recent news footage of Iran and a slideshow on a screen set up in Miyashita Park in downtown Tokyo to the backdrop of rock music, and applauded speeches calling for "a free Iran" and fair elections. In Seoul, South Korea, where about 30 people rallied, Amnesty's Park Jin-ok said the group was calling for "immediate and unconditional release" of detainees. About 20 gathered in a small square in Sao Paulo, Brazil, to take part in a 30-minute rally. Fariba Vahdat, a member of Brazil's Baha'i community, said she attended to protest "the cruelty being meted out on the streets of Iran." Dozens of activists gathered outside the embassy of Iran in Prague to protest the detention of those who protested election results in Iran. "The people could face torture and their lives are in danger," said Lenka Pitronova, an organizer of the rally. The demonstrators also want the U.N. to investigate alleged rights abuses and say Tehran must allow freedom of expression and assembly. Hundreds of thousands of Iranians held protests denouncing the election as fraudulent until security forces launched a heavy crackdown, arresting hundreds and killing at least 20. Several groups plan to protest in Washington, D.C., to condemn what they call human rights abuses being committed by the Iranian government. Organizers say they will begin at the United Nations office in downtown D.C. Saturday afternoon and then march to the National Mall. They say Nobel Peace Prize laureate Jody Williams will join them in calling for human rights in Iran and for an end to recent violence following the country's June 12 elections. United4Iran.org has posted information on protests being held in at least 110 cities around the world. In the U.S., demonstrations are also planned for Altamonte Springs, Fla., Ann Arbor, Mich., Atlanta, Austin, Boston, Boulder, Colo., Charlotte, N.C., Chicago, Cincinnati, Columbus, Ohio, Dallas, Dayton, Ohio, Detroit, Helena, Mont., Honolulu, Houston, Irvine, Calif., Kansas City, Mo., Las Vegas, Lincoln, Neb., Los Angeles, Madison, Wisc., Miami, Minneapolis, New York, Phoenix, Portland, Me., Portland, Ore., Raleigh, N.C., St. Louis, Salt Lake City, San Diego, San Francisco, Seattle, Syracuse, N.Y., Tempe, Ariz., Tucson, and Urbana-Champaign, Ill. Earlier this week, hundreds of protesters, including many on hunger strike, gathered across from U.N. Headquarters in New York this week in support of Iran's opposition movement.